Sandra Ann Cortez, died Saturday, April 7, 2018 at the young age of 45. She was born in Lubbock, Texas to Robert Flores and Henrietta (Franco) Cortez on September 22, 1972. Sandra was a loving mother, sister, aunt and friend to many, who was known for her love of animals and cooking. She enjoyed watching many different cooking shows, but the show Chopped, was her favorite. 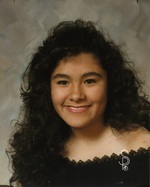 Sandra is preceded in death by her parents, husband Mario Castillo and niece Monica Nicole Cortez. Left to cherish her memory are her loving children Mario Chris Castillo, Kaci Castillo, Julianna Cecelia Castillo and Brinda Elanie Castillo; Brothers Jamie R. Bustillos, Ricardo B. Cortez, Joseph A. Bustillos and Robert Cortez Jr.; sister Donna S. McCormick and spouse Samuel N.; niece Candice M. Cortez and her children Mylos Galloway, Zoey Galloway and Avery Galloway; her beloved dog and fur baby Selina, along with numerous extended loving family and friends. The family will receive friends at Brown’s Memorial Funeral Home, 707 N. MacArthur Blvd. in Irivng, between 6:00 and 8:00pm, Thursday, April 12, 2018, with a Rosary being said at 7:00pm. A funeral service will be held 11:00am, Friday, April 13, 2018 also at the funeral home, with an interment at Oak Grove Memorial Gardens, 1413 E. Irving Blvd. immediately following. To send flowers to the family of Sandra Ann Cortez, please visit our Heartfelt Sympathies Store.